We all have our fix or our go to food/drink when we need that sense of relaxation. For some this comes from coffee, tea or alcohol. But, for a good chunk out there I believe it comes from diet coke. The reason I believe this is because I am in fact obsessed with diet coke. This may stem from many different things, but after spending a weekend up north with diabetics I feel like this could possibly be a common obsession. Diet Coke has 45.6 milligrams of caffeine in it and when comparing that to your average Starbucks Grande Coffee (16oz) which has 330 milligrams of caffeine in it - Diet coke seems to rank better. However, those that are obsessed with diet coke - may not be just drinking one or two cans per day. Now, I admit, I drink about one to two cans of diet coke or diet pop a day. Since I live on my own I don't always buy it because it can get pretty pricey, but I somehow manage to get myself a can, i.e roommates. Being obsessed with diet coke may stem from my mom (sorry mom!) who drinks diet coke probably once a day, but diet coke could also stem from my diagnosis of diabetes. Who wants to take insulin for milk, juice or regular pop? Especially if you are on the pen injections you don't want to be stabbing yourself for hydration and of course I always get, "why don't you just drink water!" but I am, and after awhile water isn't what I am craving or wanting at all. 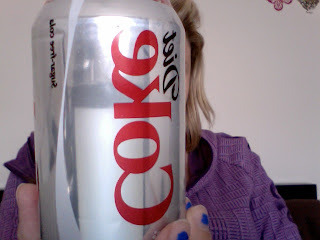 The fact is that I can drink a diet coke without checking my sugar or giving myself insulin. So I am curious! Is diet coke one of your obsessions? Yes , yes it is .